I can't activate my newly updated Z580 as my laptop doesn't have the serial number on it. I ran the belarc advisor to find out what my windows serial number is, and attempted to activate using it. It said that the activation server has blocked my activation. Is it an update from Win 8? Or Fresh install of Win 8.1? 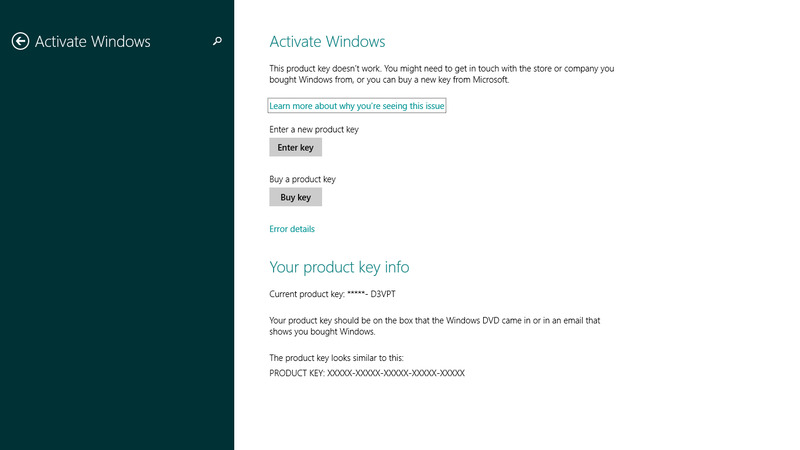 I think you don't need to activate again since it is already activated in Win 8. I like your positive thinking! However, this is not the case. If I didn't require activation, I wouldn't have made this thread. Well, I did not made any activation when I updated my unit to Win 8.1. I checked and it stated that it is already activated. I don't know what happen in your case. There must be something wrong when you update your unit. According to the blog of Mary Jo Foley of ZDNET.com "... Another spokesperson told me it's because "8.1 was intended as an update for users with Windows 8 already installed."". When Win 8 is installed you only have a few days to activate it. And since Win 8 is around for a long time it is assumed that it is already activated. In your case the only possibility I can think of is Win 8 is reinstalled then updated right after to Win 8.1. That is one possibility. Another is to register by phone if the service is still available and that product key which is for Win 8 will be accepted..